Figure 1. Advance Block pattern. 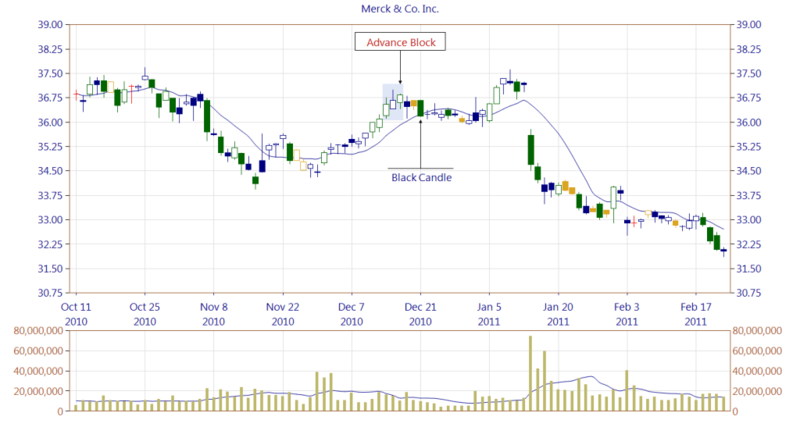 The Advance Block is classified as a three-line bearish reversal pattern. The first line is a white candle appearing as a long line in an uptrend. It can be any of the following basic candles: White Candle, Long White Candle, Opening White Marubozu, Closing White Marubozu or White Marubozu. The second line can be formed by any white candle, appearing either as a long or short line. It opens within the body of the first candle and closes above it. The last, third line, is also any white candle appearing as a long or short line. It opens within the body of the second line and closes above it. Each subsequent candle body within the Advance Block pattern is shorter than the previous one. The shadows of the second and third line should be longer than the one of the first line. The pattern indicates that the bulls are weakening. Three white bodies, however, form a support zone and to consider the pattern it needs to be confirmed. Therefore, after pattern appearance the market need to close below the first line. If this is not the case, pattern occurrence should be treated as a false one. The Advance Block is a very rare pattern. Figure 2. The Advance Block is supposed to act as a bearish reversal pattern. On the example, an Advance Block pattern is preceded by a sequence of white candles indicating that the bulls are in control of the stock. Three white candles characterize the pattern, each being shorter than the previous one. It may seem strange that such configuration acts as a bearish reversal pattern. However it is possible because the candles are getting shorter, and that’s a sign of weakening bullish momentum. The bears need to move the market below the first line of the pattern. In our example, the pattern occurrence is followed by a battle between the bulls and bears struggling for control of the market. A support zone formed by the pattern itself works. From one side the bulls cannot move the market higher anymore, on the other side the bears are too weak to move the market lower, although the Black Candle breaks a trendline. Figure 3. An example is presenting a battle between the bears and bulls. We use the "battle" word here intentionally due to the high trading volume involved for the price movement. 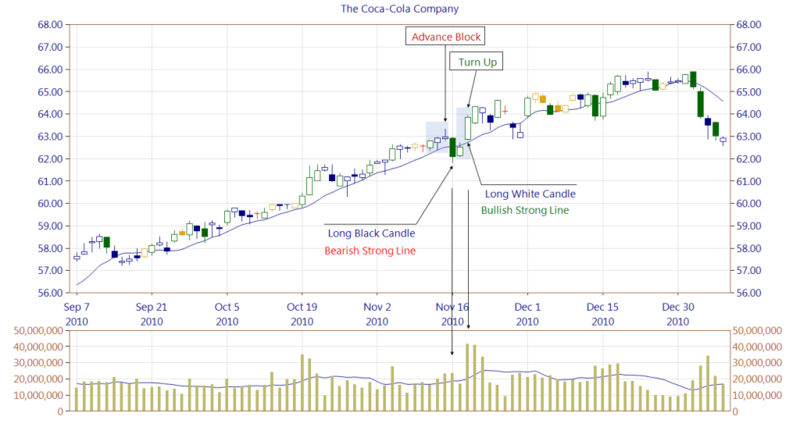 An Advance Block pattern is preceded by a long lasting uptrend. The pattern is confirmed on the following day by a Bearish Strong Line pattern and a high trading volume. Surprisingly the bulls on the next day, although the market opens near the closing price of the Bearish Strong Line, are moving the market slightly higher. They form a white body, involving a low trading volume, however. The day after the bulls behaves even more surprisingly and price gaps upward. During the day, a Long White Candle is formed which is also classified as a Bullish Strong Line. The bulls regained control of the stock. By the way, it would be very interesting to have a look at the intraday candlestick chart to see in details the market behavior. Below you can find some Advance Block pattern statistics calculated by CandleScanner software.